First, my introduction. I will mainly be posting vegan recipes (generally of the baked goods variety), many geared at a person who doesn't cook often, doesn't have much time to cook (hello, gigantic international law firm), and may have a kid running about (for me, a 5 year old stepson on weekends). But anyone who knows me may be very confused, as I am not vegan! I eat steak, salmon, and oysters much too frequently. I eat entire blocks of cheese. The more ice cream, the merrier. But a few months ago I was finally diagnosed with a food allergy, after years of living unhappily with no understanding of why. I was.... allergic to eggs. This was totally unexpected. Add in the fact that my stepson is being raised to keep kosher by his biological mom, and I decided that it was easier to keep my cooking pareve (simply put, dairy-free) rather than try to figure out who could have dairy products and when. Because my stepson has an interest in food, I try to also incorporate recipes in which a child can assist. They may not be very complicated, but they definitely taste great and keep a kid entertained. 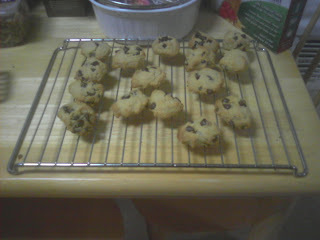 The first recipe -- the delicious chocolate chip cookie. Simple and pure. But without dairy and eggs? Without milk chocolate chips? Yes, yes and yes, and as my stepson said today, "These are REALLY delicious." He is the ultimate judge of my baking, and in the coming weeks I will be posting my pumkpin pie, chocolate mousse and Mexican wedding cookie recipes. This chocolate chip cookie recipe comes from Robin Robertson's "1,000 Vegan Recipes." It is quick to make, can be mixed entirely by hand (a/k/a safe for kids), and tastes incredibly sweet. 2. In a large bowl, cream together the margarine and sugar until light and fluffy (my own note -- I just mixed it with a spoon, and the result wasn't necessary light and fluffy but it didn't matter in the end). Then stir in the maple syrup and vanilla and mix until smooth. 4. Drop the dough by tablespoonful onto an ungreased cookie sheet (my own note -- little kid's hands are a pefect measuring substitution, and any little kid will love to squish together the mix for you to put on the sheet. This particular mix is very dry, so you will need to actually squeeze the mix in your palm into a circle so it all holds together). Bake for about 15 minutes or until slightly brown on the edges. Cool on a wire rack for 20 minutes (or if you are impatient, cool just long enough until you can pick it up without burning yourself, because this is obviously how chocolate chip cookies taste the best). The picture at the top of this post is our actual result. These cookies don't look fancy, totally circular, or overly professional, but they will satisfy any sweet tooth (I personally ate three for breakfast this morning before going to the gym, as ironic as that sounds). Hi Gilly. These looks great. I think I'll try them Wed. night for my Chanukah party. Let you know.